To add authority to your website through Google+, you need to link your website back to your Google+ Page. You have two basic ways to do this task, but a word to the wise: The more you do, the more of a boost you get in Google search results and in visibility across other Google properties. In the end, either approach provides a little Verified check mark next to your name on your Google+ Page — which tells your users that your Google+ Page is owned by the website that it displays. Click your name in the Google bar at the top of Google+, select your Google+ Page, and click the About tab to get to your page’s profile. The Profile section of your Google+ Page opens. Click the Link website button. 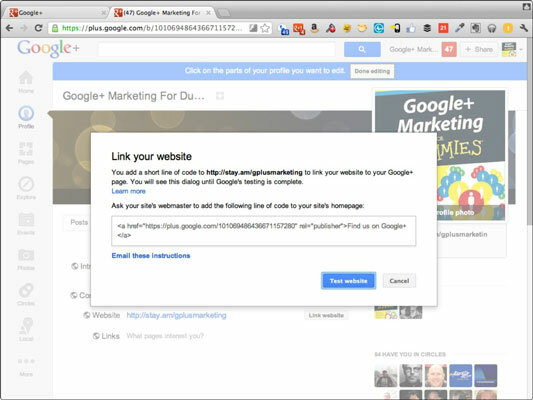 A pop-up window shows you the code you need to copy into your website (the same code shown in the next step) so that the site displays a link to your Google+ Page. If you don’t want your users to see the text link to your Google+ Page on your website, refer to the next step. Otherwise you’re done. From here, you can just skip the upcoming Step 5 because you get better results by keeping the link text visible onscreen. But okay, in the interest of full disclosure, here’s Step 5. . . .
Make sure you can still identify your website with Google. Note that you still have to replace YOUR_URL_HERE with the URL of your Google+ Page so your users are taken to the right location. Skip adding an enticing message if they won’t be seeing the text anyway. Put the line somewhere in the <head> section of your HTML. If you followed the most basic procedure outlined here, you’ll need to have an ad account with a good amount of ad spend in order to get a Verified check-mark icon next to your Google+ Page’s name that people will see when visiting your Google+ Page. The icon tells visitors immediately that this Google+ Page really belongs to you. Having this link should improve your ranking in Google search results. If you want to build even more trust among customers, a better identity and (in the long term) even more authority for your brand so that Google sees your website as the real deal, you’ll also want to integrate a Google+ Page Badge for your website. 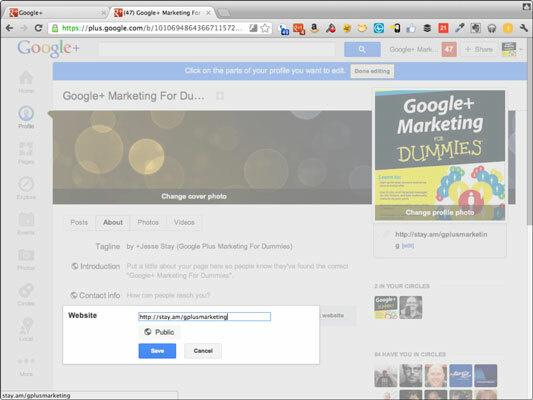 The Badge is a prominent widget that makes your Google+ Page easier for visitors to find, circle, or +1.